Gothic wedding rings are a unique and distinctive style that appeals to many couples who are less interested in traditional wedding bands. While gothic styles may not be right for every couple, they do offer an interesting variety of beautiful and symbolic wedding rings. While modern subcultures may define "gothic" as dark, brooding, and dangerous, there are actually several facets to gothic designs that can be found in beautiful and intricate jewelry. Many gothic rings embody medieval romanticism with flowers, semi precious gemstones, and carved elements and symmetry. Fantasy designs are also popular in gothic-style rings, as well as the modern interpretation of romantic horror. 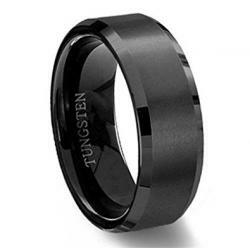 Because of this wide variety of interpretations, gothic wedding bands can have many unusual and stunning designs. While not all gothic wedding rings will be equally stark or unusual, combining these design elements into unique rings can create lovely gothic styles to symbolize a couple's union. Gothic rings are not traditionally carried by most mainstream types of jewelers and a couple may need to investigate alternative stores that specialize in gothic apparel and jewelry to find suitable rings. 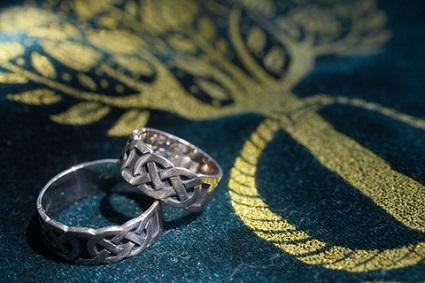 Stores that sell pagan and Wicca paraphernalia or that support alternative lifestyles may offer a selection of gothic styles, and gothic-esque rings can often be found from antique dealers. The cost of gothic rings can vary from less than $50 to several hundred dollars depending on the quality of the ring, its uniqueness, and the materials used to create it. For a truly unique gothic style, couples may want to design their own wedding rings. This can easily be done by choosing the design elements that best represent their lifestyle and relationship and incorporating them into symbolic rings. For some couples, this may be as easy as choosing an alternative type of gemstone or crystal for a semi mount band, while other couples may need complete custom rings designed by skilled artisans. Before choosing gothic wedding rings, couples should be certain that these rings are appropriate to represent their nuptials. While a gothic style may be unique and appealing, it may be less desirable after many years of marriage. The intricate details of many gothic style rings can also make them more difficult to clean, and finer engraved or delicate details can easily become worn or damaged over time. If a gothic ring is still appealing but the couple is concerned about its care or timelessness, the gothic style could be used for ceremonial purposes, including a gothic wedding ceremony, and replaced with a simpler, more traditional wedding band for everyday wear. Gothic wedding rings can be elegant and stunning and are perfect for couples who embrace a more unique lifestyle and enjoy the rich symbolism of gothic jewelry. With may design elements to choose from, it is possible to create a gothic ring for any happily ever after.